So...when I heard there was a LEGO KidsFest coming to town, I got excited! This event has been selling out in some places, so if it's coming to your area, and you want to go, I encourage you get your tickets as soon as possible! The event in my area will be held at the Suburban Collection Showplace in Novi, Michigan on April 25-27. Keep reading and enter for your chance to win a pair of tickets to the opening night show below. KidsFest brings all of the creative hands-on, minds-on fun of LEGO building and experiences together in one activity & entertainment-packed family event. It is for children of all ages, and builders of all skills and interests. I encourage you to like and follow LEGOKidsFest on Facebook, Twitter, and/or Instagram for all the latest ticketing updates. One lucky Mail4Rosey reader will win (2) tickets to the opening night session, Friday, April 25th (4-8:30 pm) in Novi, Michigan, at the Suburban Collection Showplace. Must be 18 to enter, 1 entry per day allowed. A random drawing to select the winner will be held by USFG on Wednesday March 26. Click on the link below to enter. This sounds so fun! I don't think I'd be taking Allison though. She recently got into those Lego friends, and my gosh, the anger those little pieces put in her. They fall apart very easily, and the noises of frustration that come out of her mouth would probably scare the devil! 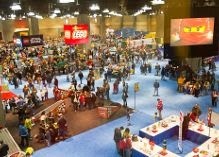 I wanted to take my son to the Legofest so bad!! Maybe next year as I think the one closest to us has come and gone already, it sounds like it would be a blast. My son loves his legos.. he is 13 and build all the time. Once in a while i will play around with him, but he has thousands to all different sets. 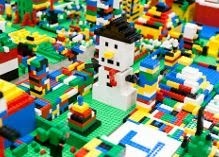 We went to LegoFest when it was in Connecticut and it was AWESOME!! I took my son last fall now in 2014 it is not coming to the West Coast. So bummed cause we talked of making it a yearly event!! This looks like such a great time! I bet my nephews would love this! They are big lego fans! I am actually planning on taking my daughter to my local one next week! This Is Great My Kids LOVE Legos They Play With For Hours At A Time Hope They Are Coming To Out Town, Thank You! We went to the one in Hartford last December. It was so wonderful! My kids are still in the duplo block stage (3 and 1) but my nieces would LOVE this ! They are VERY addicted to legos! Oh wow. How fun. My daughter would love it. Wish we were near by so I could try to get the ticket. My son would love this. I wish they had this local to us, my kids are Lego fanatics! I have never been to a lego fest but I bet If it came around here, my Grandson would want to go. A Lego Fest would be such an awesome event to attend for us, especially my little munchkin. She's very much into Lego. Oh I would love to attend a lego fest! why can't anything be closer to me! We would never leave the place! We have Lego Land here in Atlanta that my daughters likes to go to. One day my family I want to try out Lego Land in Florida. I know that'll be a lot of fun! What an awesome place to take the kids and a giveaway too! I know the Lego's are very popular, very cool! I love all the Lego events happening now! My son would have loved them when he was younger. 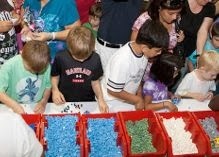 My kids love this legofest. they got overwhelmed with all lot of lego block when we went to a legofest. I got free ticket from USFG too. Awesome show. My kids would love legofest. My boys are big Lego fans. I even have a Lego rewards card. Legos are such a big thing still. They are timeless. My kids are grown but I remember how much fun they had. My kids also love lego. I must admit I love it too. Such a fun hobby. I love that "to surprise him" part!! HAAAA!! Legos I love legos so much fun and kids really learn a lot when building with them. How fun would this be to attend! My kids love Legos so I know they would love to go! I went two years ago without kids and still had the best time. I was right in there making a tower! It's amazing how lego can be fun and educational and challenging for the kids - since before until now. There was a LEGO fest in pa. I missed it but my friends had a bal. I love how Legos are bringing out the creativity in my son. He can play with them for hours at a time. The LegoFest looks like a blast! Sounds and looks like you had a lot of fun! My kids love Legos, but they are horrible with putting them away- we are still working on that part. What!? Why have I not heard of this event? Now I must see when LegoFest is coming to my area. Oh WOW, what a great place to take the little one. I'll keep this in mind for when he gets a little bigger. This looks like it was such a fun event for the kids and the adults. Lego is such a childhood favorite. That looks so fun! I would totally get into it, love Legos! Cool! Legos are totally timeless, as far as I'm concerned! Legos rock! My nephew would love this...so would I! This sounds like so much fun. I think this comes to my part of the country in June. Can't wait my kids love legos. I wish they had one closer to me. This is something that I'm sure my son would LOVE. This is my son's favorite stuff. He'd enjoy it so much! This looks like a blast!! My son is starting to get into legos and would love to take him to a place like this! I am so jealous! It looks like you all had so much fun! I used to love legos more than any other toy I had! This is awesome! I wish it were closer to us! My brother and I loved legos as a kid. We didn't have many so we loved going to friends homes that had them. I know my kids would love to attend but I try and not do legos because they never pick them up. Maybe when they're a bit more responsible we'll try again. Great giveaway though.